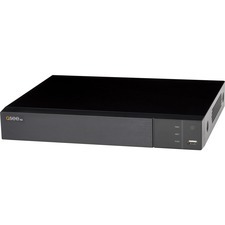 Marketing Information: Protect your business or retail property with Q-See's 16-Channel Analog HD 1080p Security System. With a powerful combination of affordability and an easy DIY simple setup, ensuring your personal property or business assets has never been an easier experience. PIR Technology takes your motion detection to the next level by greatly reducing inaccuracies and false motion alerts to ensure your security is in the top of its class. With PIR enabled technology, motion is detected through the heat of a person or object thus boosting the accuracy and effectiveness of motion triggered alerts. Larger objects are even capable of being detected such as cars, trucks and vans that can pose additional security threats to your business or property. Take advantage of amazing security features such as being able to remotely monitor your properties from anywhere in the world with our easy to use Q-See Mobile App (iOS/Android). No contract or subscription fees required. Trust in knowing your property can be properly monitored with our advanced picture optimization and compression technologies. Expand to a total of 16 HD Cameras allowing your security surveillance to expand as you grow. Protect what matters the most - get the Q-See Security Advantage.